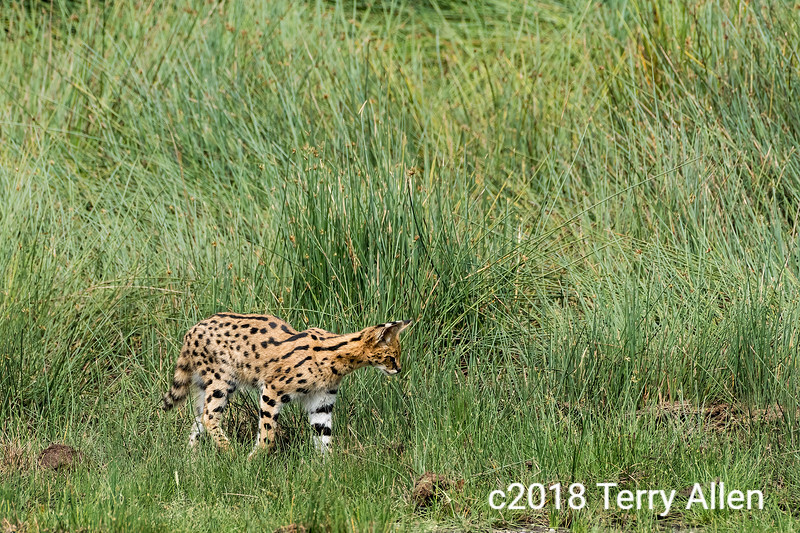 Serval cat (Leptailurus serval) hunting for prey in the long grass, Lake Ndutu, Tanzania. Rodents are a favourite prey species. They listen with their big ears for the prey rustling in the grass and then leap high in the air and pounce on the prey with their forepaws and dispatch it with a bite to the back of the neck. Awesome capture of an animal in the wild most of us won't get to see! I think servals are so beautiful..wonderful capture!! Wow, what a beautiful cat! I would be so thrilled to see this beautiful fellow/girl in the wild. The ears are just amazing. Great capture, and I'm glad you caught it unaware as it is totally focused on finding its prey. It feels like the cat isn't even aware of you and your camera--nice view of him hunting. Lovely looking small (well, smaller than lions and cheetahs and leopards) cat. Hope you got to see it catch something.